Acuity laser measurement sensors include over twelve varieties of laser triangulation sensors, three long-range laser rangefinders and a versatile laser line scanner. The AR700 laser displacement sensors are a series of high accuracy measuring devices for industrial application. Models vary in measuring range and can achieve resolutions better than 1.0 micron. The AccuRange 600 models are often used in metal working and forest products industries. 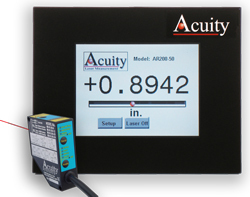 The AR700 laser distance gauge is Acuity's newest high resolution measurement sensors. Models vary in measuring range and can achieve resolutions better than 0.2 micron. Increased sampling speeds to 9.4 Khz satisfy the requirements of the road profiling industry. AR3000 distance measurement sensors are Acuity's longest-range models. Ideal for measuring positions of cranes and trollies, the pulse time-of-lfight sensor can reach 300 meters to normal surfaces and up to 3000 meters when using a reflective target. With sampling speeds to 2 KHz, the AR3000 sensors can monitor the speed of moving targets. The Touch Panel Display can control Acuity laser sensors and display their distance readings. Using serial communications, this smart terminal includes firmware applications for calculating thickness and other dimensions without the need for a computer or software programming. he Touch Panel Display with color TFT display is designed to work with Acuity AR200, AR700, AR1000, AR3000 and AR4000 laser sensors.